Instructions: Toast the bread slices and cut into 1/2-inch cubes. Cut the tomatoes and peaches into 1/2-inch cubes as well. Cut the corn kernels off the cobs. 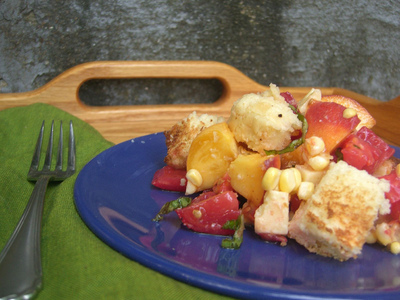 In a bowl, layer the bread, tomatoes, peaches and corn. Whisk together oil, vinegar, salt and pepper to make vinaigrette. Sprinkle vinaigrette and basil over salad and toss gently. Stir in cheese and let stand for 10 minutes before serving to allow flavors to blend. Makes 4 servings. Enjoy! Recipe and photo are copyright of FoodieTots.com and may be shared for personal use only.